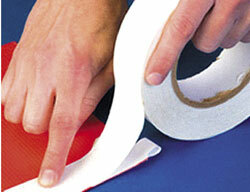 Banner Hem Tape is PVC carrier double coated with an aggressive solvent based acrylic adhesive. and that is supplied on an easy-release glassine paper liner. This product is useful in creating a wide range of indoor and outdoor signage. It has strong adhesion, that is good for finishing advertising banners without sewing or grommeting and it’s best used with vinyl banner material.